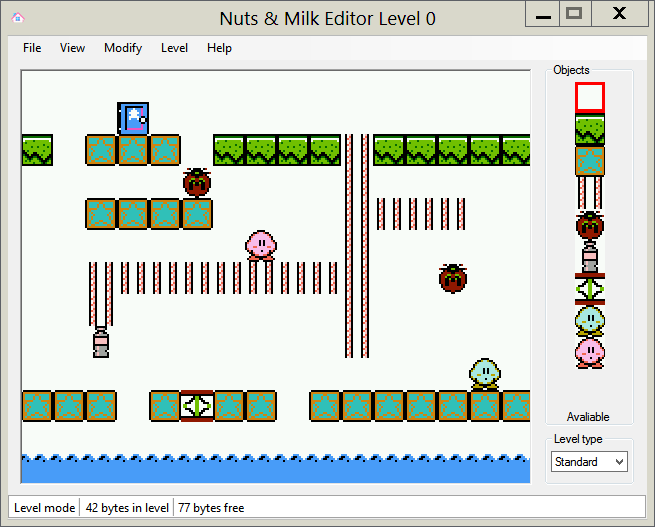 I wanted to hack the levels of old N&M hack called "Kirby's Nuts" the author that made the hack was kidwhatever. I found this hack on the years ago when I started hacking, I'm not sure why this happens when other hacks I opened up in the editor looks fine. Any thoughts on this, fellas? This particular hacker probably moved/changed stuff in the ROM. If that's the case, you won't be able use the editor anymore. Well, you miiight, it may just look broken in the editor. Try messing with the first level, and see if it plays properly. From there, you will know if you can edit in scramblevision mode without breaking the game. This sounds familiar problem, Im gonna guess the hack used bad bump of the game which doesn't work correctly with the editor. You could try patching the hack to the good bump or just copy the graphics to good, working rom. It's weird, because Nuts&Milk uses no mapper, has only 1 PRG bank and 1 CHR bank. Either it's a corrupted ROM, or the graphics were seriously shuffled in the editing process, in which case this symptom is expected if the editor has hard-coded offsets for tile mappings.